So I finally decided to do Shrek & Fiona’s wedding cake! 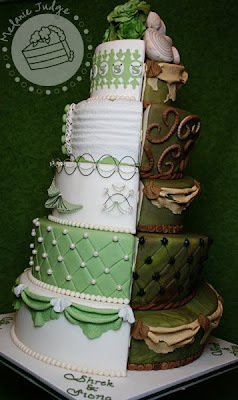 Fiona’s half of the cake would be a very traditional wedding cake with soft green accents. And Shrek’s half would be very “swampy” with lots of bugs and creepy crawlies. Fiona’s side was topped with roses – always a classic wedding flower. 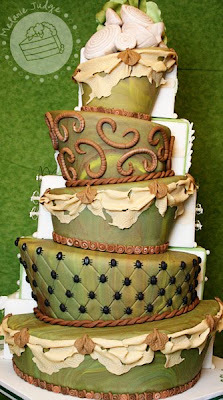 On the first tier, I used a lace mold purchased from CalJava and added the Shrek “S” with royal icing. On the second tier, I used a different lace mold to create the pleating you sometimes see on a wedding dress. 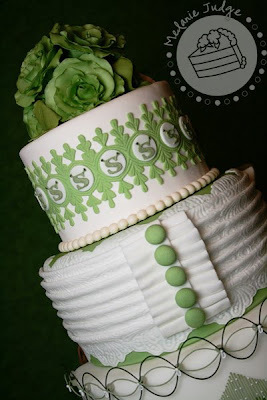 The buttons were made by pushing green fondant into a large JEM Cutters Daisy Center Stamp. The third tier is my favorite because it has string work and extension work. Along the top and on the sides, you see Oriental Stringwork, which is basically strings that curve upward and downward. I just learned this technique from Geraldine Randelsome at the 2010 FL ICES MiniClasses so it was perfect timing! In the center of the tier, you see standard bridgeless string work. I promise, I’ll post tutorials on all kinds of extension work soon. I love it! 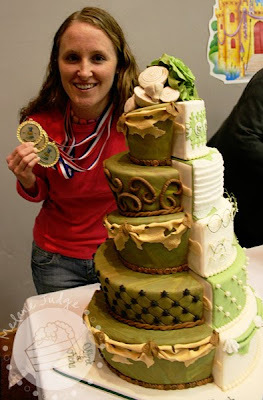 If you ever plan to enter a cake decorating competition, plan some string work and extension work into your design. These techniques are highly regarded as a difficult thing to master, but it just takes patience and perfect icing. I can’t wait to show you how easy it really is! The fourth tier was decorated with quilting. This is a VERY simple technique, especially if you have a quilting tool like this one. However, I am picky about what I spend my money on, so I create my quilting with a ruler. This is such a popular look right now so I had to include it. 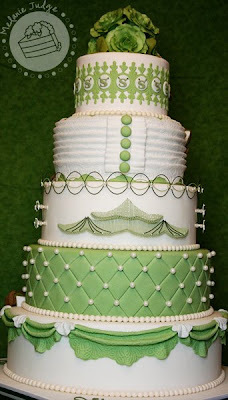 And the 5th tier was decorated with lace drapes. 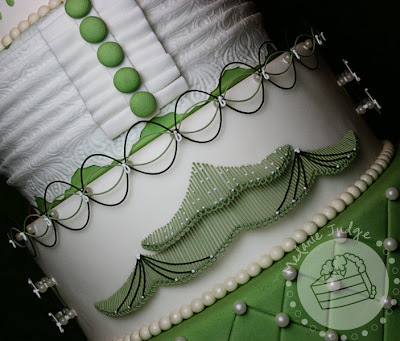 Again, I created the lace pieces with a lace mold and just draped it across the top of the cake. It’s an easy technique but looks so nice! I topped Shrek’s side of the cake with onions. If you’re asking yourself, “why would she do that?” you need to go watch the first movie again! Ogres are like onions – lots of layers! 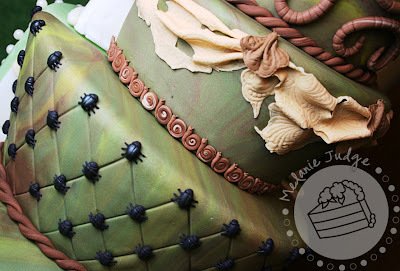 On this side of the cake, I wanted to recreate techniques cake decorators use…but with bugs! A “snail/bead border” is one of the first things you learn as a cake decorator so, naturally, I made sugar snails for Shrek’s side. I also used similar lace drapery except I browned this lace and tore it. Between each lace drape is a brown moth. The moths were Adam’s idea – love it! 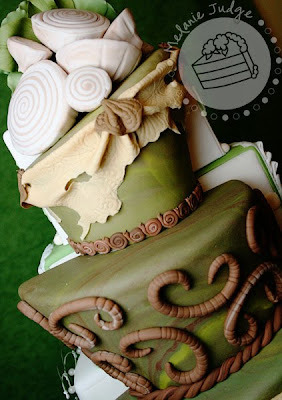 Another technique that’s really popular on wedding cakes is swirly piping so I swamped it up a bit by making the swirls earthworms. These were fun to make, and someone actually approached me at the competition to ask if I had experience with earthworms since they were so detailed. Actually, I do! I’m a scientist, remember? I’ve dissected quite a few earthworms in my time. Hey, you can’t say I’m not using my degree. On the 3rd & 5th tiers I did some more draping – only because I couldn’t think of anything else to do! And on the 4th tier, I did some quilting. But this time, instead of pearls at the line intersections, I made little black beetles. Yes, the beetles have 6 legs because they are in Class Insecta. Ah, see? There’s that science again! After dropping off my entry at the competition, Adam & I went to get some chow. Mikkel recommended Peg Leg Pete’s so that’s where we went! 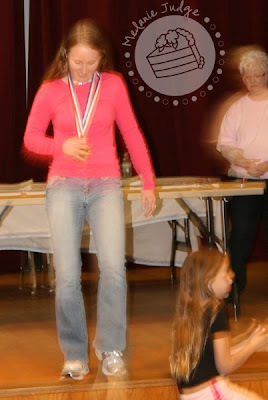 Then we headed back to the competition for the cake tasting competition and awards ceremony. In order to receive the medals, I had to walk up a small flight of steps. We all know that’s reason to panic! I’m naturally clumsy and it only gets worse with so many eyes on me. 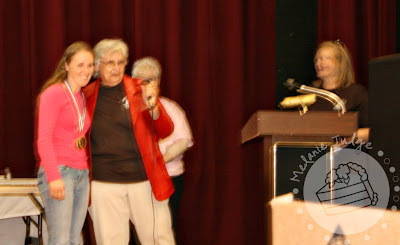 So I was really concentrating on getting up the steps, getting the medal, and getting back down the steps safely. 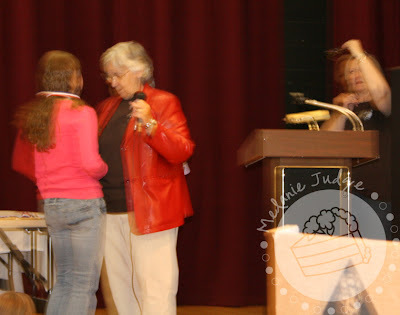 Finally, Susan (Competition Chair and the one with the microphone) grabbed me and made me stand still for a photo. Oops! So that’s it! End of story. What’d you say? You want to know more about the cake tasting? Oh…you had to ask, didn’t you? Well, there were 5 entries into the tasting portion of the competition. I brought a basic white cake with a layer of fudge filling and a layer of raspberry cream filling. Two of the other entries were pumpkin cake with caramel icing (by Rhonda Pulley and won 1st place) and a chocolate-covered cherry cake (by Sharon Posey and won 2nd place)! Then, there was a tie for 3rd! As soon as I heard that, I said to Adam “Wow, I’m going to be that one who doesn’t medal.” And sure enough…I was the ONLY one who didn’t win a medal in the tasting competition. Was my cake flavor not gourmet enough? Or did my cake just take awful? Hm… Well, now I know what to work on for next year’s competition! In any event, I really enjoyed my day in Pensacola. I think at some point during the day, every member of the Cake C.R.U.M.B.S. club came over to talk to me for a minute. They were all so sweet and welcoming! I’m already looking forward to next year’s competition, and I’m hoping some of my fellow central and south Floridians will join me! OMG, Melanie! This cake is stunning, the details are so realistic, and I just love everything about it. Congrats, girl! Congrats, wow 3 Medals good for you!!! What a original idea of the 2 cake halves. I love how you have the onions near the flowers and all the pretty decorations on Fiona's side. Fantastic job. Wow…wow! My jaw dropped when I saw this. You should be so proud and totally deserve Best in Show!!! Umm, I don't think I will enter bc you'll blow me out of the water. You inspire me, Melanie! I am totally not worthy!!! BTW, love the sneaker cake too! You are absolutely amazing! I stumbled across your blog a few weeks ago and love everything about it. But this cake made my jaw drop! Congratulations on your medals, you deserve them! Love the idea, congratulations on a fabulous idea. OMG! Congrats! Your cake is amazing! I just stumble upon your blog and i have to say i LOVE all your work! They are all incredibly amazing! Keep it up! I would love to have a cake like that for my wedding it takes care of the groom cake too. I love different. I've taught gifted for 15 years and this is the kind of thing I appreciate the most. I'm an aspiring cake decorator, and I stumbled upon your blog looking for inspiration. So glad I did! This cake is by far my favorite cake I've EVER seen. What a fantastic idea. So creative, original, and gorgeous! I love the details. Actual snails for a snail border. How clever! You have definitely become a huge inspiration to me, every cake of yours I see makes me want to pursue cake decorating even more. Thanks for sharing! 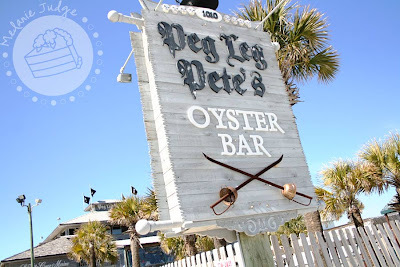 Did you like Peg Leg Pete's? And that's one of my FAVORITE cakes you've done!